One late-in-the-day shot of Canadian National Engine No. 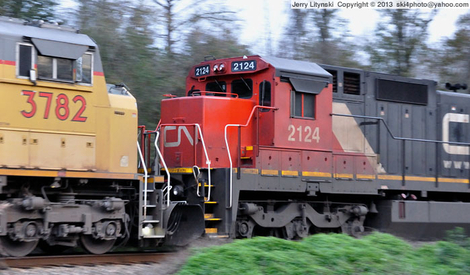 2124, as it went through McDavid, in NW Florida, USA, on 26 Dec. 2013. The train was moving south towards Pensacola, for a trip north across the Florida Panhandle to the East Coast...on CSX railroad tracks.